Portable exhausters for use with XPert™ balance enclosures and weigh boxes, Precise™ HEPA-filtered glove boxes, and Protector™ XVS ventilation stations, demonstration hoods, and workstations. Exhausters use carbon and/or HEPA filters to remove hazardous powders, particulates, or vapors from the exhaust air stream, returning filtered air to the environment. No ducting to the outside is required. Exhausters are capable of filtering up to 250cfm with HEPA or carbon filtration and up to 200cfm with combination HEPA/carbon filtration (60–100fpm), depending on enclosure model. 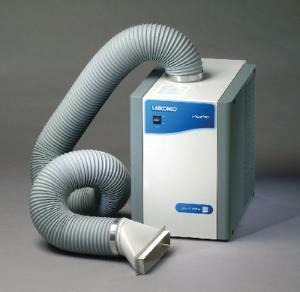 The HEPA filter cell is 99.99% efficient on particulates 0.3µm in size. Models with a HEPA filter have a true bag-in/bag-out filter disposal system for safely removing and replacing the filter without detaching the hose. The HEPA filter may be easily accessed by removing the exhaust cover. Thimble connection includes a 15.4cm (61/16") I.D. thimble that enables exhausters to be used with house exhaust systems. Ammonia filter cell is a type CX filter that contains 7.3kg (16lbs.) of impregnated carbon media suitable for ammonia and low-molecular weight amines. The formaldehyde filter cell is a type C1 filter that contains 6.4kg (14lbs.) of impregnated carbon media suitable for vapors from formaldehyde. The organic filter cell is a type AC filter that contains 5.4kg (12lbs.) of granular activated carbon media suitable for organic solvents including acetone, ethyl acetate, toluene, and xylene. The syringe kit is for carbon saturation detection (detector tubes sold separately). The flexible hose is static dissipative, making it suitable for pharmaceutical and cleanroom applications. The 2.4m (8') long hose has a smooth bore with white helix and includes two clamps. Exhausters fit easily on a countertop, floor, or shelf next to the enclosure. The variable speed, non-sparking, motorized impeller may be adjusted to optimize airflow. The filter, impeller, and unique perforated exhaust cover work together to provide low noise levels. A negative pressure plenum surrounds the positive pressure impeller so that if a leak occurs, the unfiltered air is captured and refiltered. Exhausters include a front-mounted rocker switch that controls power to the blower and a rear-mounted auxiliary electrical outlet. Certifications: The 115V models are ETL and ETL-C listed. The 230V models are CE marked. Ordering information: One FilterMate™ exhauster is required for use with all 0.6m (2'), 0.9cm (3'), and 1.2cm (4') enclosures that are 57.8cm (223/4") high. Models for use with a HEPA filter include the HEPA filter. Models for use with carbon-based filters require purchase of the filters. Exhausters include a 2.4m (8') length of 12.7cm (5") I.D. gray flexible hose, two clamps, a 12.7cm (5") O.D. upper transition adapter, and a three-wire cord with plug. Items designated below as REDISHIP™ can be shipped within 48 hours of receiving your order. The HEPA filter cell should not be used to capture biohazardous materials or volatile organic material.